Wozniak had been dabbling in computer-design for some time when, in 1976, he designed what would become the Apple I. 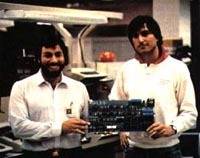 Jobs, who had an eye for the future, insisted that he and Wozniak try to sell the machine, and on April 1, 1976, Apple Computer was born. Hobbyists did not take the Apple I very seriously, and Apple did not begin to take off until 1977, when the Apple II debuted at a local computer trade show. The first personal computer to come in a plastic case and include color graphics, the Apple II was an impressive machine. Orders for Apple machines were multiplied by several times after its introduction. And with the introduction in early '78 of the Apple Disk II, the most inexpensive, easy to use floppy drive ever (at the time), Apple sales further increased. With the increase in sales, however, came an increase in company size, and by 1980, when the Apple III was released, Apple had several thousand employees, and was beginning to sell computers abroad. Apple had taken on a number of more experienced mid-level managers and, more importantly, several new investors, who opted to take seats on the board of directors. Older, more conservative men, the new directors made sure that Apple became a "real company," much to the dismay of many of its original employees. In 1981, things got a bit more difficult. A saturated market made it more difficult to sell computers, and in February. Apple was forced to lay off 40 employees. Wozniak was injured in a plane crash. He took a leave of absence and returned only briefly. Jobs became chairman of Apple computer in March.